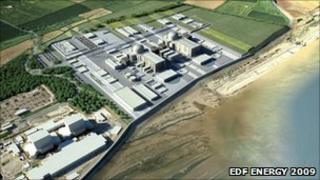 Six in 10 people support a new power station at Hinkley in Somerset, according to a survey carried out on behalf of the energy company EDF. EDF said it was not surprised by the results as "as local people have been supporting us for a long time". Jim Duffy from Stop Hinkley said the support was understandable as there was "nothing else on the horizon". One thousand people who live within a 25-mile radius of Hinkley Point took part in the poll run by ICMI. The survey was carried out in Sedgemoor, Taunton Deane, and West Somerset. David Eccles, from EDF, said: "We're going to be bringing £100m per annum during construction into the area for salaries and contracts, when we appoint our major contractors, they'll need sub-contractors. "All the people that come to site, 5,000 at peak, that's a huge workforce and they're all going to need supporting. "We're determined that as many as possibly can who meet the standards who are able to compete for the contracts can get them, and we want to give priority to local people." Mr Duffy said: "Hinkley C, if it comes about, would provide a lot of jobs for people and people want to pay their mortgages but it doesn't mean they would necessarily would opt for that job if there was an equally well paid job in that area. "However there's nothing else on the horizon, so it's understandable that people would support a big investment like that in the West Country. "EDF have gone about this in the right way and asked 1,000 people across a wide area but they haven't asked people in the worst affected area what they think about it. "I suspect that if they went to Burnham they would get a very different answer."